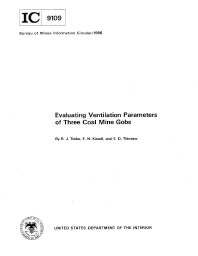 The Bureau of Mines used sulfur hexafluoride (sf6) tracer gas to evaluate the effectiveness of gob ventilation and/or sealing practices at three coal mines, each having different problems associated with their mined-out areas. The purpose of these ventilation studies was to better understand whether current techniques employed for ventilation or sealing are successful at minimizing the potential for gob fires and explosions. The work performed at each mine is discussed: one is a longwall operation that uses ventilation to carry off hazardous gases, and two are room-and-pillar operations, each with far different concerns, that seal off the gobs to isolate them from the main mine ventilation. In all cases, employment of the Bureaus sf6 tracer gas technique resulted in answers to questions raised by the mine operators concerning the effectiveness of their gob ventilation or sealing practices in preventing mine fires.